You should notice a couple of new features. Firstly, I am now listing the national polls that have come out since the last update -- today there are a ton of them -- just so that we can be more fully transparent. Also, we now have a way to indicate tracking polls: they are designated with a slash. So, for instance, a "3000/3" (as for the Rasmussen Tracker) means that the poll included a rolling sample of 3,000 voters conducted over a 3-day window. Obviously, there are a lot of great numbers for Obama today. Essentially all of the CNN polls look good for him, as do the other couple of Florida polls. 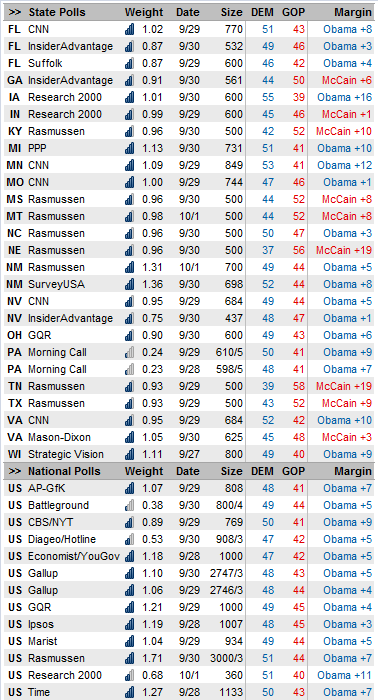 Rasmussen has him maintaining his lead in North Carolina, and PPP has him way ahead in Michigan -- enough, apparently, that MCcain has now given up on winning the state (more on this when I get a moment). There are also a handful of good numbers for McCain -- Mason-Dixon in Virginia, and the New Mexico polls show Obama stalling a bit, though still comfortably ahead. But clearly, it's been a big Obama day, and the McCain campaign now seems to be aware that their electoral map is falling apart. Somewhat counterintuitively, Obama's national win percentage did not increase; in fact, it went down just a tick from yesterday. This is principally because the model had already "priced in" a lot of these sorts of results. It expected, for instance, that when CNN again polled a state like Florida, it was going to show a very nice result for Obama, since CNN had been relatively favorable to Obama in Florida before. Also, when there is such a high volume of data to process, the regression models that underlie the model can be significantly recalibrated, which can shift things by a point or so here and there. Let's not get bogged down in the technicalities, however. Clearly, the McCain campaign is now on the defensive, and needs to knock a couple of points off Obama's numbers across the board before it starts to reestablish some sort of winning electoral map. Tonight's debate could be a step in the right direction -- or, if things go badly for Sarah Palin, a near-fatal blow.